Introduction: It has been estimated that overweight and obesity worldwide affects 1.7 billion people with LGBP being the most performed bariatric surgery worldwide. 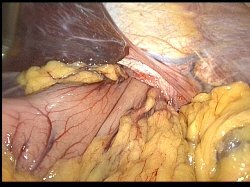 We are presenting a rare complication of laparoscopic gastric bypass surgery (LGBP); Herniation of gastric remnant into the left chest. Methods: Our patient is a 54 years old female who underwent a LGBP in 2004 for morbid obesity with a BMI of 60. She experienced excellent weight loss results, decreasing her BMI down to 37. She presented 4 years later with complaints of chest and epigastric pain. An extensive cardiac work up was done that was negative. 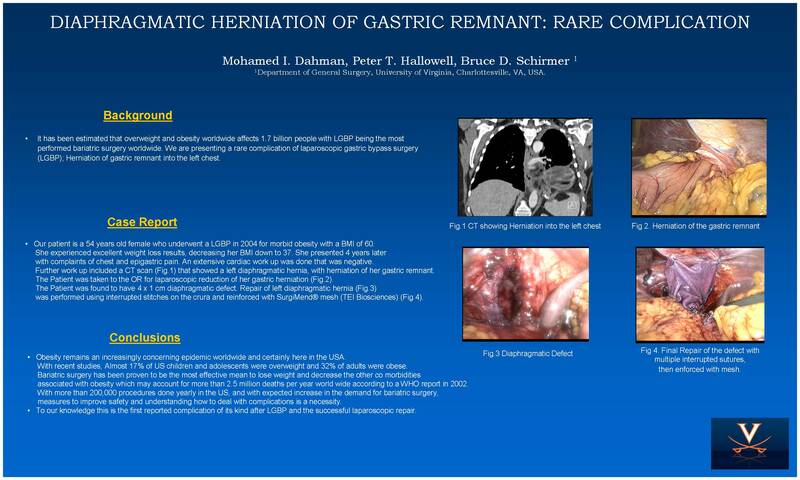 Further work up included a CT scan (Fig.1) that showed a left diaphragmatic hernia, with herniation of her gastric remnant. The Patient was taken to the OR for laparoscopic reduction of her gastric herniation (Fig.2). 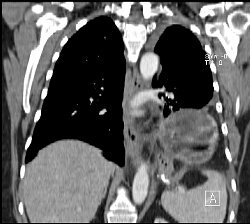 The Patient was found to have 4 x 1 cm diaphragmatic defect. 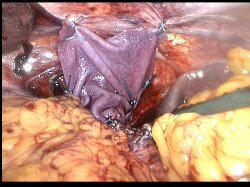 Repair of left diaphragmatic hernia (Fig.3) was performed using interrupted stitches on the crura and reinforced with SurgiMend® mesh (TEI Biosciences) (Fig.4). Results: Our patient had an uneventful recovery with full resolution of her symptoms. Conclusions: Obesity remains an increasingly concerning epidemic worldwide and certainly here in the USA. With recent studies, Almost 17% of US children and adolescents were overweight and 32% of adults were obese. Bariatric surgery has been proven to be the most effective mean to lose weight and decrease the other co morbidities associated with obesity which may account for more than 2.5 million deaths per year world wide according to a WHO report in 2002. With more than 200,000 procedures done yearly in the US, and with expected increase in the demand for bariatric surgery, measures to improve safety and understanding how to deal with complications is a necessity. 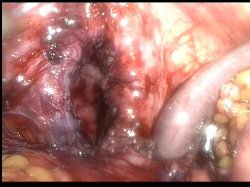 To our knowledge this is the first reported complication of its kind after LGBP and the successful laparoscopic repair. Fig.4 Final Repair of the defect with multiple interrupted sutures, then enforced with mesh.